And it’s allll wrapped up in a sweet little cotton bag. Applause all around for this line’s beautiful packaging! 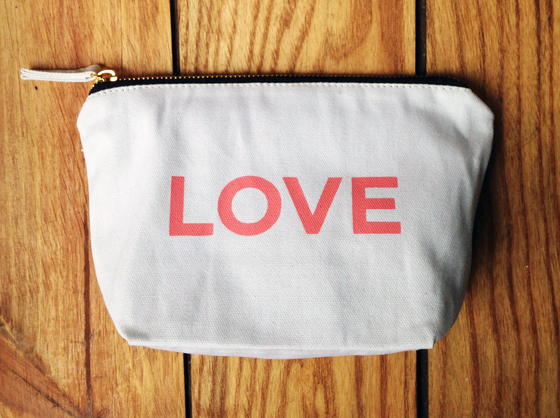 It brings a smile to face every time I peek into my “LOVE” bag and retrieve the pretty-in-pink-and-black products inside. All of the items in the kit are effective and gentle, and I’ll use them down to the last drop/granule. The stand-out for me is the beauty balm, because it’s so multi-functional and a real game-changer for dry winter skin. Let’s get to it. It’s the balm. (See what I did there?) I don’t want to act overly enthused about this product (which I am), so I’ll try to play it semi-cool. But seriously, this product is so, so good, that you will actually ask yourself how you ever lived without it. The obvious answer is that you weren’t really living. (Kidding. Kind of). As a cleansing balm: Massage the Skin Savior balm all over your face and neck, then wet your shammy with warm water and wipe off to remove dirt and grime. For cleansing your face, this balm makes a perfect wintertime product, because it leaves a silky, moisturizing layer atop your skin, instead of stripping your skin, like many other (chemical-laden) face washes. I’m using this ritual morning and night, and my skin doesn’t even know it’s winter. I totally punked the hell out of my complexion. GOTCHYA. Oh, and not sure what a shammy is? I wasn’t either: it’s made from 100% pure dermalogical grade microfiber chamois, pulling dirt and oil away from your skin with less product for up to 200 washes. 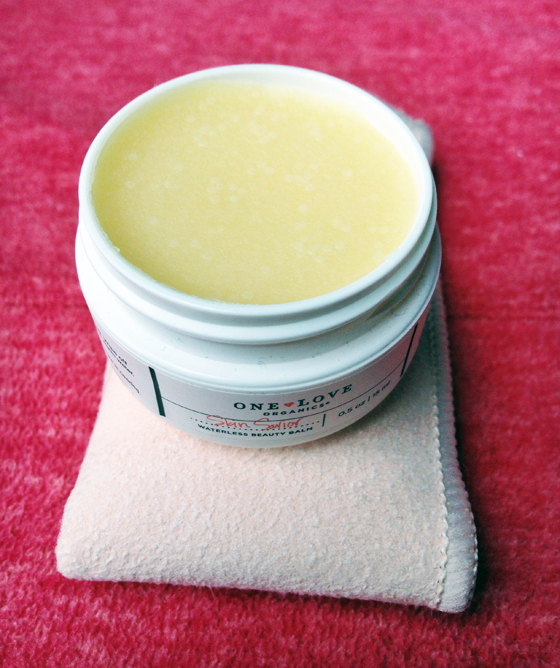 As a moisturizer: Like I said, this balm is juicy and packed with moisture. Coconut oil, mango seed butter, chia seed extract and other ingredients nourish and coat your skin. So, after cleansing and applying my daily argan oil or other moisturizing serum, I dab Skin Savior around my eyes, around and on top of my lips, around my nose, and any other place on my face that’s feeling super dry (sometimes I just put it all over my face, okay?!). It gives a dewy glow to the skin and keeps me moisturized all day. Add water and exfoliate. Boom. I first used this bad boy as a scrub. Afterward, my face felt as polished and smooth as a river rock. It really was the dawn of a brand new day for my complexion, y’all. This product is sneaky, though: the particles feel super fine in your hands (the scrub’s all-clean ingredients include corn starch and sweet pea flour). If you’re anything like me, you may be doubting their exfoliating power as you’re mixing up your paste. But once applied and rinsed off, you’ll emerge feeling completely clear of buildup and residue. Whatever junk – make-up, dead skin cells – was lurking on your complexion ain’t gonna survive this scrub. In fact, the bitty granules are so small and mighty that I’m restricting myself to using this just once a week, though the label states that it’s gentle enough for everyday use (so go right ahead). Which means, even with the sample size, I’ll have many Brand New Days to come! Using this product as a mask feels like an added bonus: once I’ve scrubbed a bit, I leave the product on my face for 15 minutes and then rinse. Extra goodness. I’ll take it! A warning to those who tend to be a bit heavy handed (Sauv Blanc, anyone? ): don’t overdo it on the water here, and be sure to follow the measurements on the package. It’s easy to waterlog your paste, so add water by the teaspoon, slowly. A great (and award-winning) everyday cleanser. I have to say that I’ve missed the foam and froth of traditional, chemical-laden cleansers. 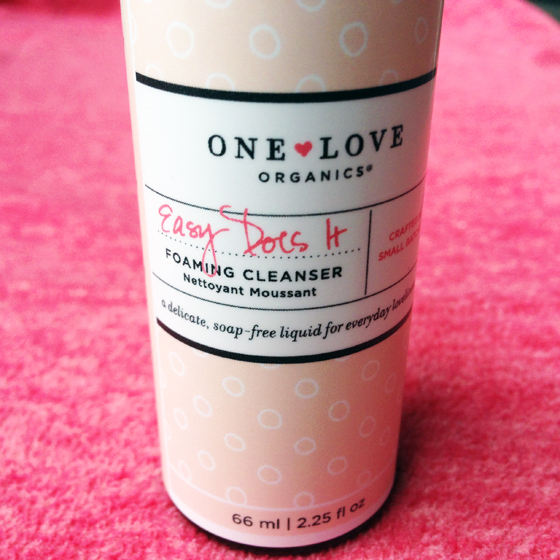 My daily cleansing ritual involves a mixture of rosewater, tea tree oil and vegetable glycerin, which is far from bubbly – so using One Love Organics’ NATURAL foaming cleanser has been a nice change of pace! It cleans effectively and works double and triple duty on body and hair. I’d recommend this for anyone looking for a fairly priced, easy, daily cleanser. 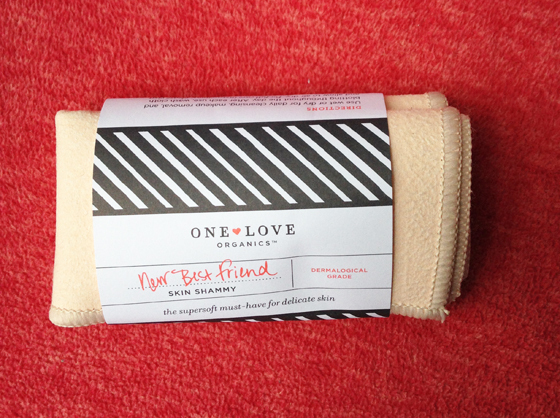 What are your favorite One Love Organics products? It really is delicious! Wish all my products had such a lovely scent. And enjoy the scrub, I think you’ll love it! Give a shout once you give it a try. I was thinking of heading over to my local health food store today to see if I could get some OLO samples…ya never know, the beauty gods might smile down on me. Love this review as much as alllllll your others – you have a blogging gift woman! Ooooh, girl, I’m sending you all my good beauty vibes & voodoo. Hope you got some samples! 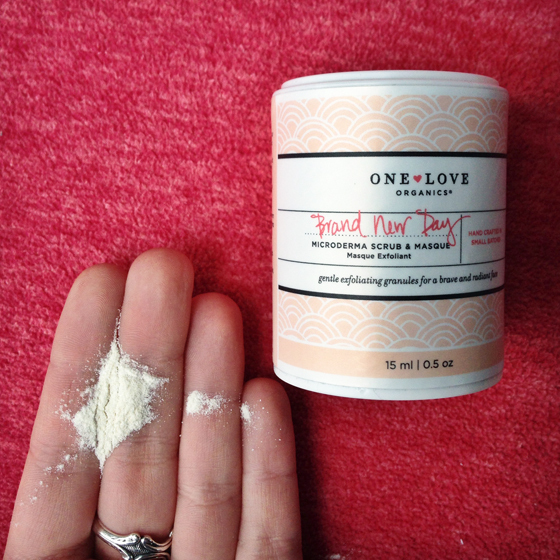 I’d like to try pretty much everything from One Love Organics…googly eyes. And you are TOO kind, thanks for reading, lady! I just ordered the Vitamin B Cleansing Oil and added on the sample pack that includes some of these products! I fell in love with the Vitamin B Cleansing Oil after trying a sample, and I’m super excited to try more products from their line! OOOOH, that’s from the collaboration with Beauty Bets/Elizabeth Dehn, yes?! I somehow missed the cleansing oil in my pass through the site (got distracted by the serum) but that sounds amazing. Thanks for mentioning it & let me know how it is! This all sounds so lovely. I love reading your posts your writing is just amazing it makes me want it all! I’m off to see if I can get this anywhere when I go to New York! OLO was my very first organic skin care and I totally love them too! They are a great “gateway” brand! I want to introduce them to all of my friends. I am addicted to harsh soap and water to get that “clean” feeling on my face… but need to make a serious switch to all natural face products! This inspires me to give it a shot. Less harsh sounds way more appealing for my sensitive skin. I understand this 100%. I always felt “cleanest” when my hair squeaked and my face was all dry & tight. Once I realized that extra moisture + using balms and oils on my face didn’t break me out I was like wait…why wasn’t I doing this all along? It’s definitely a transition to go to bed after using a cleansing balm/more gentle cleanser for the first time, but I bet you’ll grow to love it! Excited to hear what you buy and how it works for you. YAY FOR YOU.